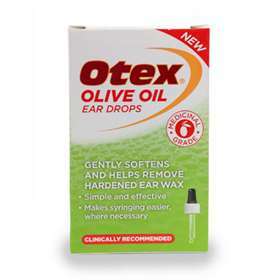 Otex Olive Oil Ear Drops helps to gently soften, remove hardened wax and makes syringing if needed easier. Tilt head and gently squeeze 2 to 3 drops into ear without touching the ear with the end of the dropper. Leave for a few minutes and then wipe surplus with tissue. Repeat once or twice daily, if necessary, for approximately 14 days while symptoms clear. If irritation or pain occurs during use, or if symptoms persist, stop treatment and consult your doctor. Always replace cap after use and return bottle to carton. Before treating a child consult a doctor so that an ear wax problem can be confirmed. You are allergic to olive oil. You have a history of ear problems, unless used under the close supervision of your doctor or pharmacist. You are putting anything else in the ear (such as other ear drops or a hearing aid). Your eardrum is (or has been) damaged. There is anything else wrong with your ear (such as pain, swelling, discharge, infection, or tinnitus). You have had your ear syringed in the last 2 to 3 days, or tried to remove the earwax using fingernails, cotton buds or other implements as this could make it painful to use the ear drops. If in doubt consult a doctor, nurse or pharmacist before use.